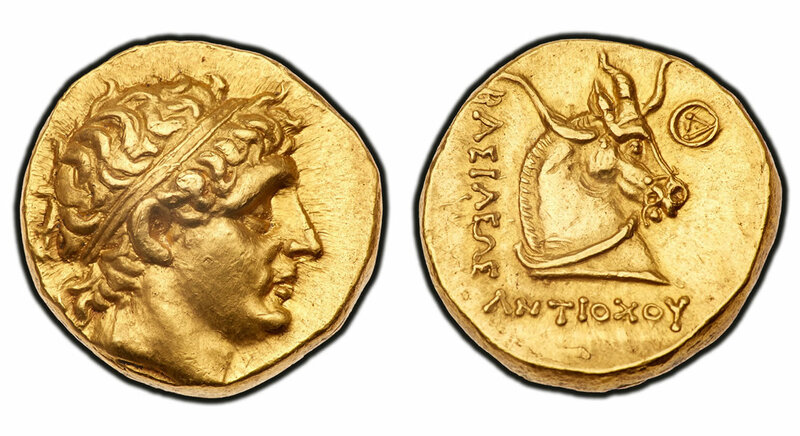 The second public display of a portion of the extensive numismatic treasures in the recently revealed Tyrant Collection (www.TheTyrantCollection.com) will include outstanding examples from the origins of coinage including a rare example of the world’s first gold coin. An apparently unique variety Antiochos gold Stater, 280-217 B.C., is among the Tyrants of the Tigris and Euphrates exhibit from The Tyrant Collection at the June 2018 Long Beach Expo. Photo courtesy of Goldberg Coin & Collectibles. "The Tyrants of the Tigris & Euphrates" exhibit will be at the June 14-16, 2018 Long Beach Coin, Currency, Stamp & Sports Collectible Expo (www.LongBeachExpo.com). 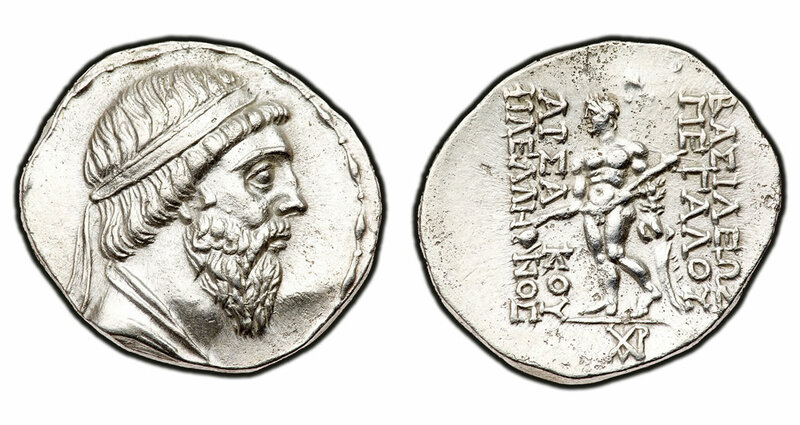 A bold portrait of King Mithradates I is on this Parthian Kingdom silver Tetradrachm, circa 154-132 B.C., and is a highlight of the Tyrants of Tigris and Euphrates exhibition at the Long Beach Expo, June 14-16, 2018. Photo courtesy of Goldberg Coin & Collectibles. One of the earliest recorded coins with both a type and an inscription, this electrum Stater of Ephesus, circa 625-600 B.C., is one of the highlights of the Tyrants of the Tigris and Euphrates exhibition. Photo courtesy of Goldberg Coin & Collectibles. The owner of The Tyrant Collection wants to remain anonymous while he shares the collection’s coins with the public for their educational value through a multi-year series of displays at the Long Beach Expo. The owner has assembled an unprecedented private collection of coins of tyrants of every age and every major civilization. Each section of the far-reaching collection is named after the principal water source of the civilization. One of only about two dozen known examples of the world’s first gold coin, this Stater prototype, circa 564-539 B.C., of King Kroisos now in The Tyrant Collection was formerly in the Zurich Money Museum Collection. Photo courtesy of Goldberg Coin & Collectibles. "The inaugural Tyrant Collection exhibition of English coins, ‘Tyrants of the Thames,’ this past February was a tremendous success and we heard many compliments from collectors, dealers and the general public," said Ira Goldberg, President of Goldberg Coins and Collectibles, Inc. (www.GoldbergCoins.com) in Los Angeles, California. "This next display will feature nearly 2,600 years of superb condition coins from Ionia, Persia, Turkey and Western Asia. In Greek, Mesopotamia means ‘(land) between the rivers.’ Mesopotamia is the land between the two great rivers, the Tigris and the Euphrates. Mesopotamia spawned the earliest civilization, which included writing, mathematics, metal working, the wheel, and spectacular wealth," explained Goldberg who provided guidance in assembling The Tyrant Collection. "The Tyrants of Mesopotamia is the longest collectible series of coins. Quite a challenge," he added. "The entire Tyrant Collection undoubtedly is the world’s most valuable rare coin collection in private hands, worth hundreds of millions of dollars," said Goldberg. "These exhibits with different coins displayed at upcoming Long Beach Expos will be a once-in-a-lifetime opportunity for many collectors, dealers and the public to see in person some of the world’s most significant rare coins. Visitors to the June Long Beach Expo can receive a free, illustrated booklet about this latest, amazing exhibit."